In addition to the RSS feed I have where you can get all my posts the second I publish them, I’ve added Twitter to the party! 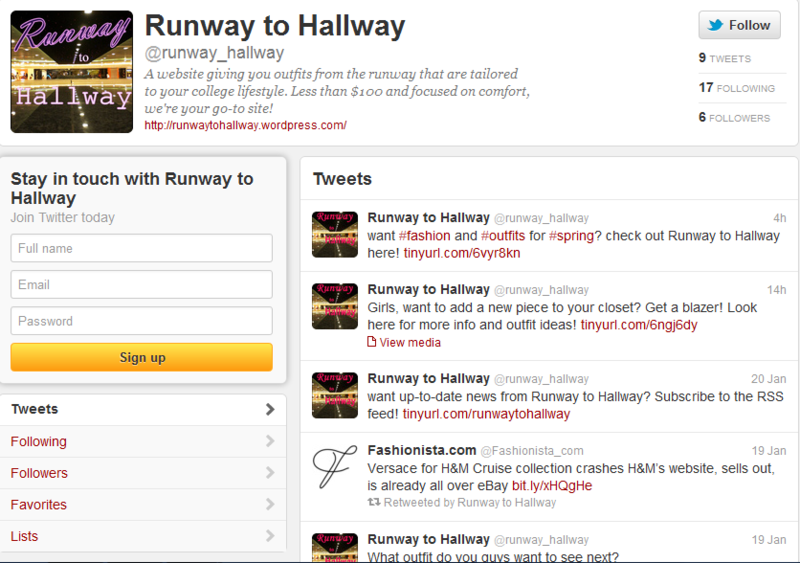 If you have a twitter (and if not, you should definitely get one), you can follow Runway to Hallway at @runway_hallway. All my posts will be tweeted so you’ll have more than just one way to stay up to date. If you ever want to send me a comment or a suggestion, you can also just tweet at me instead of commenting on a blog post here. But I won’t just be posting my blog posts! I’ll be retweeting from sources like @OscarPRGirl, @MBFashionWeek (especially once Fashion Week comes around in a few weeks), and designers like @ErinFetherston so you can stay up to date with fashion news as well! Drop by and give a quick tweet on my twitter!